This entry was posted on Tuesday, May 29th, 2007 at 3:00 pm	and is filed under Cats, Dogs, National Dog, Cat & Pet Info, Art & Pictures of Cats & Dogs. You can follow any responses to this entry through the RSS 2.0 feed. Both comments and pings are currently closed. That cannot be real…..is it? Is that a real dog? Oh, I’m sure that’s a real dog! 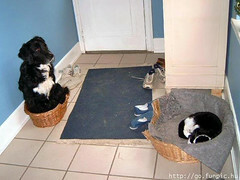 If they could, my cats would do this with my bed! It happened just exactly like that to our 6 year old mutt when we fostered a 9 week old Beagle pup. Our cats just pee on the dog’s bed. It spends more time in the laundry than it does being used by the dog. This could become an issue! Dog: Hey furry little thing, hello? This is no fair. Hey furry little thing! Wake up! This can’t be right!! !